The calendar says that the first official day of fall has passed, but it never feels like fall until the Heartland Apple Festival at Beasley&apos;s Orchard arrives. I&apos;m not alone in these sentiments, as this prized event draws an impressive crowd of locals and visitors each year. This year&apos;s festival will be the weekends of Oct. 1-2 and 8-9 from 9 a.m.-6 p.m. each day. Beasley&apos;s Orchard is located at 2304 E. Main St., Danville. Parking is $5 per carload. Last year, my family visited the orchard many times during the season for apples, fresh produce, treats, the Dog Daze at the Maze and the Heartland Apple Festival. No longer a family with little ones, we found the experience a bit different than previous years. The husband and I were able to wander around and enjoy stopping and talking to friends and even some relatives that were also visiting. 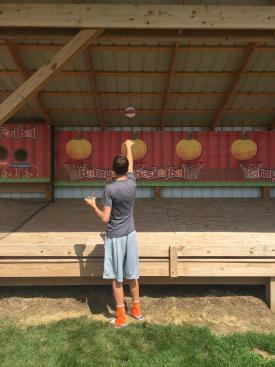 Our teens were off buying cider slushies and working up a sweat throwing balls in the Barnyard Bonanza area. The grounds at Beasley&apos;s are absolutely gorgeous. For generations, this family-owned and operated orchard has taken great pride and gone to great measure to maintain and care for every inch of the farm and every aspect of their business. As you approach the beautiful, well-preserved barn, you&apos;ll find bright-colored pumpkins of all sizes, mums and all the seasonal gourds, Indian corn and squashes your table and front porch could hope to be adorned with through the fall. As groups of friends and family gather around picnic tables near the stage, I appreciate all the planning and work that goes into hosting an event of this size that has become a tradition for so many -- my family included. I appreciate that while they&apos;ve made additions in hopes of offering more fun and entertainment to guests of all ages; they have done well to keep festival favorites, such as the hayrides to the pumpkin patch and hay mountain. I appreciate that while I pick up a bushel of my favorite apple inside their beautiful, historic barn that my kids can pick out cider and their favorite treats with ease. I appreciate that they offer families the opportunity to make memories and enjoy the simplicity of the season with a stroll through the corn maze or picking that perfect pumpkin. 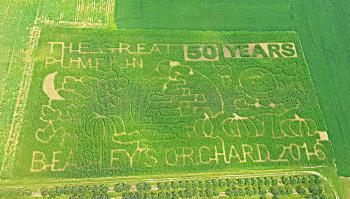 This year&apos;s maze celebrates the 50th Anniversary of It&apos;s the Great Pumpkin, Charlie Brown. The 4 miles of pathways wind through the 8-acre maze and offer fun for guests of all ages. You&apos;ll receive a passport, containing a series of questions that will help guide you to the correct route. Most guests complete the maze in less than an hour, but some chose to take a little more time. Tickets are $7 per person for guests 3 years and older (2 and under are free). A trip through the maze is included in the wristband combo for $12 a person. Take a tractor-drawn hayride for a scenic view of the farm and a visit to the awesome 15-acre u-pick pumpkin patch. Guests can take a ride just for the simple enjoyment of taking in the farm and the seasonal treat of visiting the pumpkin patch, but they can also pick a pumpkin for purchase. Prices vary by size. This simple fall activity is a season staple. Tickets are $3 per person for guests 3 years and older (2 and under are free). A hayride is also included in the wristband combo for $12 per person. This is a great addition they made last year. In the Barnyard Bonanza play area, guests of all ages will enjoy the ball zone - where they can pitch baseballs, throw footballs and shoot basketballs. Additionally, the little ones will love the spiderweb rope climber, corn crib (like a sandbox, but filled with corn) and enormous inflated jumping pillow. Tickets are $6 per person for guests 3 years and older (2 and under are free). Barnyard Bonanza is also included in the wristband combo for $12 per person. Admission is for the entire day of play. Children 12 years and under must be accompanied by an adult - but the adult will probably want to play, too. A mountain of straw can provide hours of entertainment. Many folks, such as myself, have pictures of their littles climbing up and down the "mountain" each and every year. It&apos;s tradition. And kids love it. The climbing that is, not so much on the posing for pictures. Guests can climb for free. Fall is delicious at the Heartland Apple Festival. In the barn and outside the Barnyard Bonanza, you&apos;ll find yummy cider slushies. Of course, you can also taste and purchase Beasley&apos;s award-winning cider. 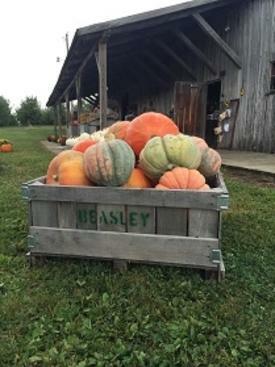 The market in the barn at Beasley&apos;s is full of all kinds of wonderful produce, freshly baked goods and treats. You&apos;ll want to pick up a bushel - or two - of your favorite apples and a hand-dipped caramel apple. Homemade apple butter and fried biscuits from the Boy Scouts booth is always a hit. As are the pork burger sandwiches from the Hendricks County Pork Producers booth and ribeye sandwiches and hot dogs from St. Augustine&apos;s Church. Come hungry. You&apos;ll hear live music and catch a puppet show on the stage throughout the festival. Wander the craft and merchants area to do some shopping and enjoy wine tasting by Indiana Wineries. I hope you get the chance to take a day - or more - to enjoy this incredible farm and all the seasonal activities offered. We always enjoy our time at the Heartland Apple Festival and look forward to the fall feeling it brings.